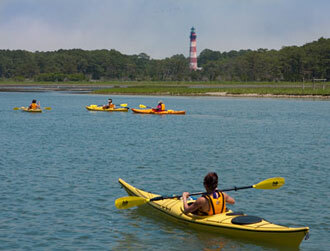 Kayaking in Virginia: Assateague is one of the best kayaking destinations. The kayak tour by Assateague Explorer takes you to the best areas of Assateague Island National Seashore and Chincoteague National Wildlife Refuge. A unique experience that departs from Chincoteague, VA. Explore the warm back bay waters (water temps: 70 to 90 degrees) of Assateague Island while kayaking into calm creeks, coves and a vast array of pristine inland waterways where wild horses can be found. Our kayak guides take you into awesome areas to see wildlife along Assateague Island and Chincoteague Island, Virginia. 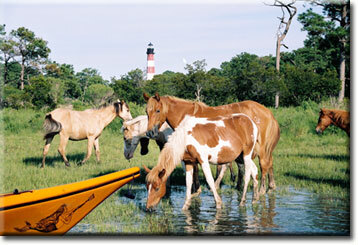 See the famous Assateague Lighthouse and have a chance to paddle alongside wild ponies, bald eagles and other wildlife. Land at a beach on Assateague where wild horses roam. We use premium kayaks & our guides know the area. Kayaking is fun. You will enjoy the best of Virginia kayaking here on the kayak trip. Bird watchers, naturalists, outdoor photographers and kayakers love the areas we take them into with our kayak tour and boat tour. We have provided quality ecological tours here since 2001. Our company was recently featured on the ABC “Good Morning America” show with a story covering our nature tours. We are credited with incorporating the most desirable approach when it comes to seeing the wild ponies and experiencing this area. We use premium sea kayaks & sit on top ocean kayaks that are faster with superior performance and can cover the area with grace. Our kayaks & high-grade fiberglass paddles get you to Assateague and Chincoteague’s prime places in an efficient way for an outstanding experience. Explore with us in our new touring style or ocean sit on type kayaks along Assateague's back waters where wild ponies & other wildlife live. The kayak tour is suitable for most paddlers. Scouts, school groups and others love kayaking here in Virginia. Many guests have little or no prior kayaking experience and they enjoy learning a bit about kayaking, seeing the ponies, bird watching and exploring this great ecosystem. For most people paddling comes naturally after a short lesson and practice session. We provide life jackets, but be prepared in the rare case you would happen to go overboard. The waterways do have deep channels although some places it is only 3 feet deep or less. The kayaking tour is an awesome way for you to connect with nature while on your vacation. The kayak tour gives you an opportunity to see the wild ponies, eagles, osprey, loons and a vast species of shore birds close-up. Our kayaking guides will brief you on safety and proper paddling technique before leaving the shore and help you identify wildlife and points of interest during the tour. There are many diverse aspects of this inner-coastal environment that will interest you. On some occasions we can see dolphins during the kayak tours. 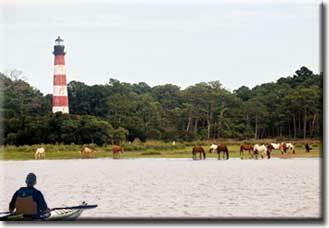 Your best chance to see dolphins & more herds of ponies is on the mothership Assateague Explorer tour boat. The boat tour can cover a vast area, so it often gives you a chance to see more herds of wild ponies, birds and wildlife in another unique way. You can do the boat and kayak while visiting here. Kayaking allows you to relax and enjoy the fantastic scenery. Visit remote beaches on the kayaking trip where wild ponies and many species of birds frequent. The kayaking tour is well-suited for family kayaking and provides an excellent opportunity to view wild ponies or other wildlife from a kayak. 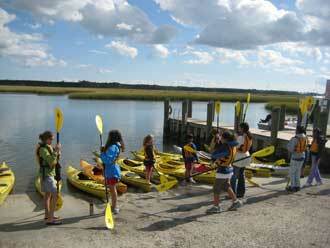 Learn about kayaking and the many aspects of this coastal environment. 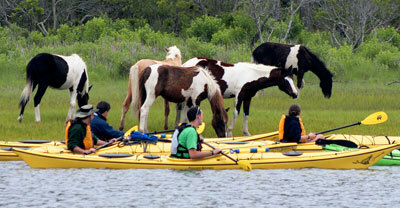 Reserve your kayak tour now and discover hidden Assateague with Assateague Explorer. Chincoteague kayaking to Assateague Island. The kayak tour is tax free.  Includes kayak guide(s), kayak, paddle, PFD & kayaking instructions. 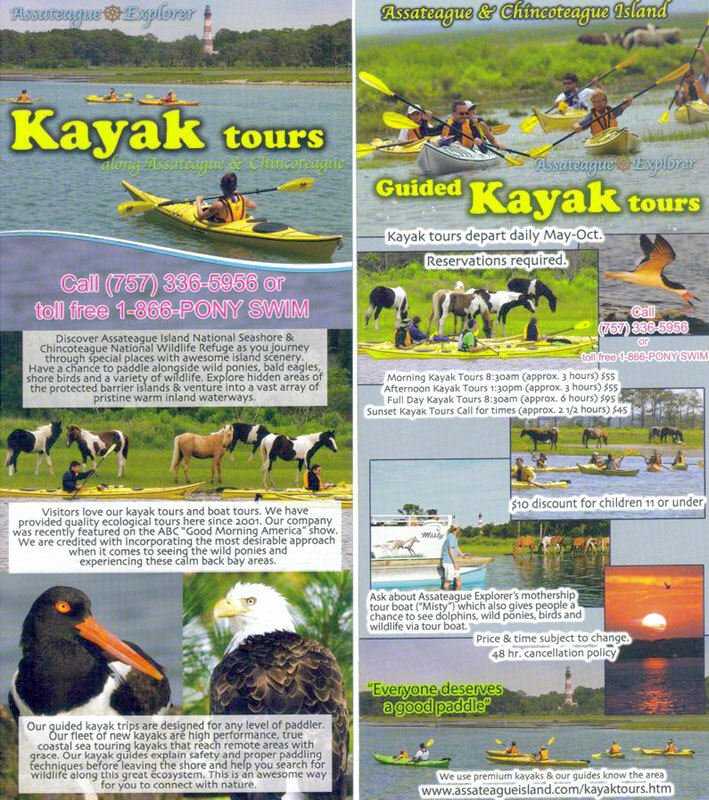  Kayak Tour starts in Chincoteague Island, VA. Call (757) 336-5956 or 1-866-PONY SWIM (toll free). We can arrange custom itineraries for schools, scouts, clubs or corporations interested in planning activities tailored to the interest of their group. Group discounts available. • Release forms must be signed for kayak tour & rentals. The schedule & price are subject to change. Adventure awaits as you search for ponies and other wildlife along Assateague & Chincoteague Island. Weather and environment: The back bay waters during late April - October are generally warm (65 - 90 degrees). The final decision on which route we will take is made by our experienced native boat captain & our kayak guide. We do not usually cancel a trip because of light rain, drizzle or chance of showers. In fact, most people want to go because these conditions often result in some of the best trips and wildlife sightings. If the weather is severe and we cancel but you are unable to reschedule, you receive a full refund. Surprisingly enough, we are able to operate trips on the vast majority of most days during the season. We operate in the back waters of these barrier islands. We limit the number of participants per tour. If you cancel, you must do so at least 48 hours prior to the scheduled tour to receive a refund. Please see the cancellation policy.